Enjoy a magical opportunity to explore Thailand’s rural heartland on board a converted teakwood rice barge. After experiencing the sights and sounds and the hustle and bustle of Bangkok city, this three-day cruise takes you out of Bangkok up the Chao Phraya River into the rich agricultural central plains. See firsthand the traditional way of life of Thailand’s rural communities, which are far removed from the usual tourist trail. We begin the tour in Bangkok with a visit to the huge and important Grand Palace complex, see the reclining Buddha at Wat Pho temple, and have lunch at a restaurant by the river. 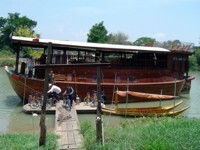 After lunch we take a private long-tail boat and explore the canals in the rural suburbs of western Bangkok. Here we visit an orchid farm, temple, and possibly a local school, and see how people live and work by the water before seeing the boat house where the royal barges are stored. We leave Bangkok onboard the 'Thanathree' or 'Treasure on the Water' for the highlight of this tour. The boat carries up to 12 people with plenty of room to relax and watch the world drift by on the upper & sun decks, with a simple but comfortable air-conditioned multishare cabin and on-board shower and toilets. Meals are prepared on board, and you are welcome to assist with this and learn some Thai cookery if you wish. We make frequent stops over the next 3 days to explore the countryside and observe the different ways of life and cultures of the rural Thai people. We'll see traditional handicrafts being produced and meet with the local people, in a world far removed from the usual tourist haunts. We carry bicycles on board and the tour features several easy bike rides through rural villages and farmland. There is also plenty of birdlife to observe from the boat as you sail along. We return to Bangkok on a fast modern boat with lunch on board, and finish the tour with an early morning visit to the colourful Damnoen Saduak floating market, with several other options available for your final afternoon, including an introduction to Thai cookery. Note: This tour is an shortened version of our Rice Barge Experience tour. Extensions to the tour are available to visit Ankhor Wat in Cambodia, or to head to the beach. You can also add a rice barge cruise to several of our other tours, or use it as the base for a tailor-made itinerary.